Ultraviolet curing system with lampheads of variable dimensions and power, adaptable practically to any format according the needs of the treatment. UV lampheads made of extruded anodised aluminium. Shutter system using compressed air for stand-by. Quartz heatproof plates permeable to ultraviolet radiation. 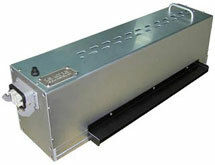 Linear power regulation by electronic ballast. Automatism control by PLC and touch screen. Ventilation with turbines of half pressure and automatic wealth regulator by air temperature.